Five rising stars working in the Wisconsin newspaper industry have been named “Future Headliners” by the Wisconsin Newspaper Association Foundation. The recognition program – first launched in 2014 – honors emerging new leaders (age 30 and under) in the news media industry who display good character, leadership and professionalism not only at work, but in the communities they serve. The Future Headliners will be honored Friday, April 13 during the annual WNA Convention and Trade Show at the Sheraton Madison Hotel. Future Headliners show a commitment to impacting the newspaper industry in a positive manner and will serve as ambassadors for the WNA throughout the next year. They were selected from a pool of nominees for performing their jobs to a high standard and being committed to furthering their knowledge and abilities. 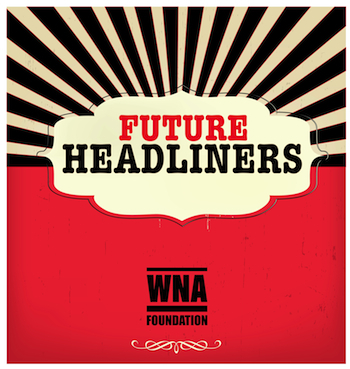 The Future Headliners program is made possible by the WNA Foundation, a nonprofit organization that supports programs that foster excellence in journalism, engage current and former newspaper leaders and invest in our communities. The Foundation solicits, manages and disburses funds and other resources for the benefit of Wisconsin’s newspaper industry. Ryan Broege was raised on a dairy farm outside of Janesville, Wis. He earned an English degree from the University of Wisconsin –Platteville in 2012, where he cultivated a passion for media and journalism under the instruction of Professor Art Ranney. He completed an internship at the Janesville Gazette in the summer of 2012, and then kicked around in various job fields, including a brief stint in New Orleans pursuing a legal career. After working a number of agricultural and warehouse jobs, he spotted a Craigslist ad calling for freelancer reporters in a town 25 miles west, at the Brodhead Independent-Register. After four months of freelancing there, he assumed the role of editor. Erin Caughey joined the Journal Sentinel in 2014 as the first Marquette University O’Brien Fellowship intern. During her internship, Caughey contributed reporting and multimedia to the Alfred I. Dupont Award -winning series, “A Watershed Moment: Great Lakes at a Crossroads,” as well as other watchdog team projects. Caughey was hired full-time as a special projects, features and news producer in January 2015. She has since expanded her work at the Journal Sentinel to include web design and development and utilized those skills to build the online experience for several major newsroom series including the Edward R. Murrow winning series “Unsolved | A murdered teen, a 40-year mystery.” She has a bachelor’s degree in journalism from Marquette University. Kasi Greenwood, 27, first stepped into the world of journalism in September of 2017 as a reporter for the Dodgeville Chronicle. Her adventure began serving Iowa County, in the rural community where she grew up, covering feature stories. Prior to journalism, she earned a bachelor’s degree from UW-Platteville majoring in Agricultural Business, Communications and Marketing emphasis, and navigated through different career fields. In 2018, she accepted the role as a Dodgeville Chronicle assistant editor. She has been learning layout, and covering area happenings such as city council meetings, school board meetings, editorials and feature stories. She also assists with taking photos at school events. Amber Levenhagen’s passion for journalism started with a general interest in photography and photojournalism. After a brief stint with marine biology, she switched career paths and eventually graduated from the University of Wisconsin-Whitewater in 2016 with a degree in journalism. She worked as a staff writer and photography editor for the student-run weekly newspaper, the Royal Purple, for more than two of her four years at UW-Whitewater. After graduation, Levenhagen moved to Madison and started her career as a community reporter, photographer and page designer with Unified Newspaper Group, where she enjoys meeting the people of Stoughton, Oregon, Verona and Fitchburg and telling their stories. Bryan Wegter is a sports copy editor for The Gazette in Janesville. He grew up in Wisconsin’s Northwoods in the small town of Antigo before moving to the Twin Cities to attend the University of Minnesota. He graduated with degrees in sport management and mass communication in the spring of 2014, and worked as a photographer in Minneapolis before taking his first reporting job with The Star News in Medford, Wis., that fall. Wegter moved to Janesville last July to accept his current position with The Gazette, where he contributes to the sports section as a page designer, writer and photographer. He enjoys being outside as much as possible during the summer months, and counts photography, graphic design, and a variety of sports as hobbies.